Product information "Yamaha YDP 143 Digital Piano"
The Yamaha Arius YDP 143 is a good choice for beginners and developing pianists looking for a quality instrument. Because of the improved pure CF sound engine and an increased polyphony, the YDP 143 opens up more possibilities for expression. Furthermore, the Stereophonic Optimiser guarantees you the very best sound even when playing with headphones whilst the newly improved reverb brings depth to your playing. Above all this piano is also now compatible with a host of apps including the Digital Piano Controller for easy and intuitive control. Integrated with the latest digital piano technology, therefore, the YDP 143 produces accurate and natural piano tones. Also, 10 tone’s to choose from these can range from warm to bright sound to rock and pop styles. This piano has a new sampled sound of Yamaha’s renowned CFIIIS 9' concert grand piano, therefore, offering you a rich and expressive tone for incredible dynamics and expressiveness. Perfect for pianos pieces of any style. Finally, you can layer these tones helping creativity and new playing experiences. Another of digital pianos is the ability to practice quietly or in silence and the sound technology allows this without the loss of sound quality. The headphones experience has been upgraded from the previous YDP142 model, therefore, the sound you hear is now more spacious with a surrounding ambiance, providing a more realistic and natural listening experience. The YDP 143 is recommended by piano teachers because of its similarity to acoustic piano for building strength and practicing finger technique. The piano has 88 keys and a hammer system similarly gives the same playability you would find on a grand piano. As a result, the keys have a heavier pressure in the lower register that gets lighter towards higher notes. The finish of the black keytops has a matte feel, therefore, making them less affected by moisture. The coating makes gracing notes with ease and improving comfort over longer performances. 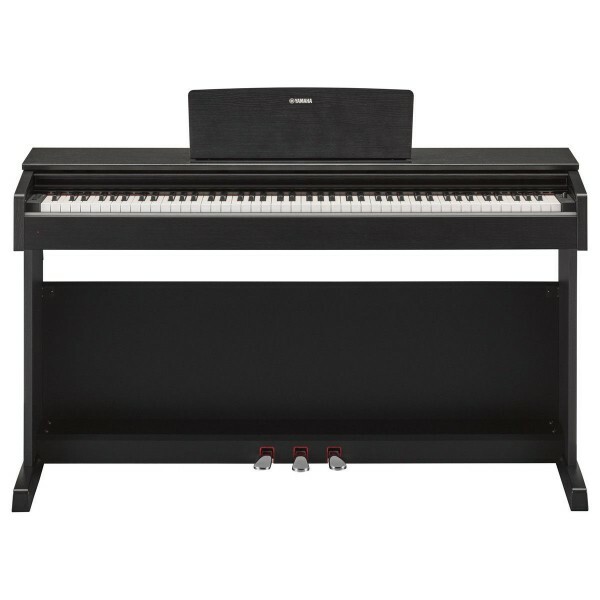 The YDP 143 is a well-suited piano for the beginner pianist for building proper technique. The weighted keys help develop strength in your fingers and the sound and tonal options will inspire creativity. For following music, the piano comes preloaded with classic piano songs from R.Schumann and J.S. Bach. These songs are great for listening but there to play along too; building your timekeeping and note accuracy. For reading exercises the book, “50 Greats for the Piano” is included. to follow along to the music and learn how to play iconic pieces. The keyboard has a duo mode creating two middle C’s allowing teacher and student to sit side by side at the same time. The YDP 143 comes complete with a grand feel 3 pedal system similar to an acoustic piano. The result is more realistic sound. The right-hand pedal is the sustain. When pressed allows the keys to be released without the note stops. The YDP 143 has a built-in recording function that captures your performance with a touch of a button, as a result, you can record up to 2 tracks for simultaneous playback. Furthermore giving you the ability to record both hands separately, or overlay parts with different voices. These tracks can be downloaded to your computer using a USB cable. Yamaha’s digital controller app is a free piano app that allows you to controls many functions included in the piano. With your iPhone or iPad, you can now control the piano from your device. Allowing access to adjust settings, select voices and even record your performances. The YDP 143 has USB connectivity making it easier to connect the piano to your computer or phone. The YDP 143 has a traditional piano design housed in an elegant, wooden cabinet. The cabinet features a sliding keyboard cover and raised music stand. The smaller speakers allow for a shorter height cabinet at 815 mm tall suitable for smaller modern homes. The color variations available are black, rosewood and white in a satin finish. Related links to "Yamaha YDP 143 Digital Piano"
Customer evaluation for "Yamaha YDP 143 Digital Piano"